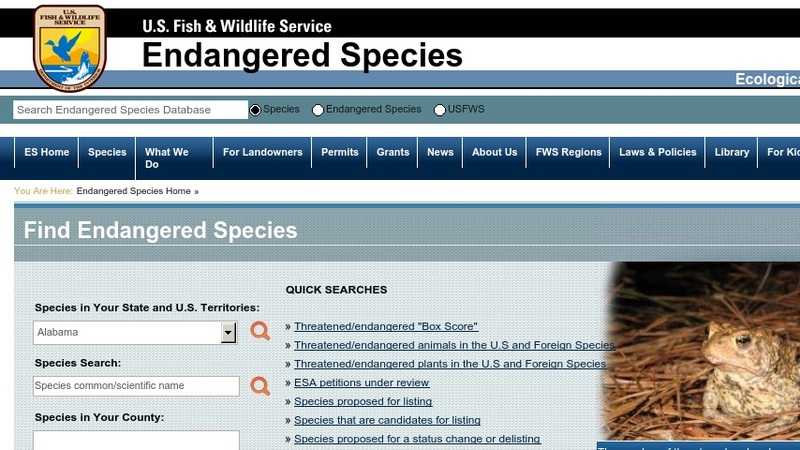 Created as a result of the Endangered Species Preservation Act of 1966, the Endangered Species Program is responsible for promulgating information about the various international agreements that protect species, maintain the listing program of threatened and endangered species, and also disseminate publications and fact sheets. As one might expect, a primary feature of the site is the actual list of threatened and endangered species. Visitors can generate and print out this list, and also peruse a list of general statistics, along with looking at species list by classification, such as clams, snails, and lichens. The siteï¿½s homepage also contains direct links to recent publications, such as ï¿½Working Together: Tools for Helping Imperiled Wildlife on Private Landsï¿½. Visitors can also look at management plans adopted by the U.S. Fish & Wildlife Service and learn about the various invasive species which are also of concern to the agency. Finally, visitors can also peruse the online archive of the Endangered Species Bulletin all the way back to 1995.